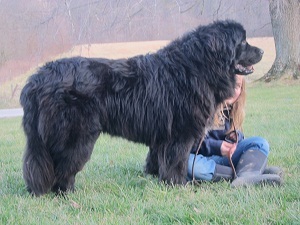 Sugar Bear Newfoundlands - Triple H's Thunderous Spirit: "Thunder": OFA GOOD hip & normal elbow prelims, patella, heart, and cystinuria clear health clearances. Thunder is good with kids and sits on command.Stud service is available. Triple H's Thunderous Spirit: "Thunder": OFA GOOD hip & normal elbow prelims, patella, heart, and cystinuria clear health clearances. Thunder is good with kids and sits on command.